The strange thing is that the aquaduct is very badly designed from a engineering point of view. Half of the pillars of the second floor stay above the weakest point of the bottom bows. That doesn't make the construction stronger. 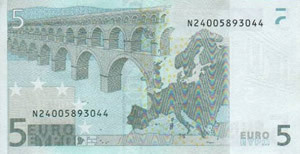 For political reasons, the objects drawn on euro banknotes do also not exist in reality.